Sure, the rare review of a Jiro style shop is usually met with disdain on this site, but the search goes on! Senrigan was a recommended shop from from a reader of the site. Thanks are in order, this one was one of the better bowls (of Jiro-kei) I've had. It's the question that gets asked at every Jiro-kei shop (kei means style or type, Jiro is a popular family of ramen shops in the Tokyo area). Have your quick response ready, or the busy staff will be on your case like bean sprouts on this bowl. Ninniku and karaage was my answer this time. Garlic and spicy bits of fried batter drippings. Also available is the Fuji-sized mountain of vegetables, mounds of pork fat, and spice. Ask for them by name. Mashi mashi if you're feeling bold. Not too intense, as can be the case at a shop like this. The pork was tender and moist, another thing which I find isn't standard. I feel a bit under-qualified to review this style. I haven't even been to the original Jiro shop in Tokyo. And my reviews are always skewed based on what I did that day. If I was being lazy, drinking and sitting around the apartment, Jiro doesn't work for me. But if I exerted myself with a bit of exercise, this stuff goes down great. On Senrigan's day, I had cycled about 40 kilometers out west and back for some work. Famished, I devoured this bowl with ease. I should also note that after every bowl of this sort, this one included, my stomach felt like I had made a mistake within an hour. Twenty minute wait at nine pm on a weeknight. I still think I'm the only person not obsessed with Jiro. I was touring a stateside ramen lover around, and couldn't let him go home without sampling this side of ramen in Tokyo. Senrigan, or maybe Fujimaru or Tatsuya, will probably be part of any future ramen food tours that I do. For the sake of the traveler. Like I said, I'm the only person not obsessed with it. The Nagi on the first floor, below the Nagi on the second floor, has closed. In it's place, another Nagi has opened. Not a lot of fanfare around this one, with an upcoming Omiya Nagi shop in the works sitting in the spotlight, but I had to give it a try. I like Nagi. A lot. The niboshi ramen here is nice. Good stuff, nothing out of the ordinary. Like I said, nice. One of the simplest menus around, the only three choices are shoyu, tokusei (all the toppings), and shio. A three-button ticket machine would suffice, if it weren't for the different sizes. When in doubt, just hit the upper left button. But then I saw the chef making something random. Surely there was no fresh-grated pecorino cheese on my niboshi ramen. An as-yet-unreleased limited menu item, jumping on the beef bandwagon. Matsusaka (松坂) beef! A quick breakdown of Japanese beef is in order. Matsusaka sits up top with Kobe and Yonezawa. All of these are just place names, the cattle are from the same breed of black wagyu. But the fame comes from the strict way the cattle are raised, as well as attention to lineage. The grain is very high quality, and yes, they are fed beer to stimulate appetite. Nagi went ahead and used a pure beef stock, topped with a slice of the highest quality beef I've ever had in ramen. The only time I have had a better piece of beef was when I paid a week's salary out in Kobe. While cross-town Matador is probably the best and most refined bowl, this limited one at Nagi is a different beast all together. Not so sweet, it's a blast of umami meat juice that will probably sell out before lunch. By the way, all that Kobe beef you hear about in America is a lie. It's Japanese wagyu cross bred with angus, given average feed, and often kept completely sober. Good stuff that makes excellent burgers, but nowhere near what we have in Japan. 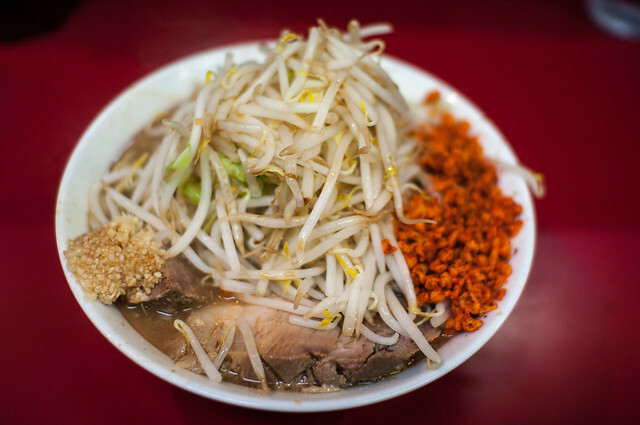 Ramen Adventures has covered just shy of 500 shops in Tokyo. Quite a feat for an overseas native, perhaps, but this number pales in comparison to some people I've met around town. One such guy was at a recent one-day-only ramen collaboration. A ramen-data encyclopedia who had visited in the thousands, I asked him for some recommendations near stations I would be working at in the coming month. Stations far, far away. Hon-Atsugi station is about an hour west of Shinjuku. I've been here a few times, but always remained seated as my train sped past. It may be far off, but good ramen can be found anywhere in Japan. Shio is a tough nut to crack. There is a reason noodles in clear chicken soup is reserved for cheap cans; the delicate flavors simply don't work when slurping. At least, they don't work as well as something thicker in viscosity or stronger in taste. But every so often, shio is done right. The toppings usually stand out as top quality, the noodles are just right, and the aroma is unmistakably umami. One of the best in town. Too bad it's so far out there. I've had a lot of great recommendations lately. Keep em coming! One of my favorite shops in nearby Hatagaya is Dokkan. Another favorite is Gamushara. There is a third in the area, though, that I had been meaning to try for ages. It's located quite near the others. In fact, Dokkan, Gamushara, and Yahiko are all the same place! The schedule of which shop is open when has evolved throughout the years. At the time of slurping, Yahiko is (was?) a weekend only thing. Wow, this makes the ranking tough. Gamushara is at the bottom, it's a bit normal, with Dokkan and Yahiko battling for the top. Just look at those noodles, coated in cheese. And that soup! A red miso from Nigata, mixed with curry spices and a touch of cream. It was decadent to say the least. The hours have been known to change. Be assured that they will probably be open, and if Yahiko isn't being served that day, something else delicious will. Hiroshi called me up at something like 9:30am . . . on a Sunday. Sure, a phone ringing at this ungodly hour is enough to break most friendships into pieces, but an hour later we were in line for ramen, drinking a cold beer. What's so special? You see, this was no ordinary bowl. A one day, limited collaboration by three of the hottest ramen names in recent ramen trends. To put it in perspective, I arrived over an hour and a half before the shop opened. I was number nine in line. By the time they opened, around 75 people were ready to eat. Only 200 bowls would be served. To say that my comrades in the early ramen-wait are fans is the understatement of the year; these people are nuts. The chefs, humble as they are, are elevated to minor celebrities around these people. I'm happy to be part of this crowd. Again, you may ask, what's so special? A triple soup, every component using the best that Japan has to offer. Pork from one of the best ranches in Hiroshima. Kochin chicken from Nagoya, of course. Fish - saba - from Chiba. Collaborations are a common thing. If you take a Pokemon attitude towards life - gotta catch em all - you'll probably never have time for a regular bowl. Miyazaki-san (Soranoiro) and staff from Saikoro (Saikoro) on the soup above. Koitani-san (BASSO) on the noodles below. Mutahiro was a recommendation from the staff at Nagi, a surefire indication that it will be good. The staff have paid their dues, working at both Nagi and Gamushara in the past. What's the concept here? Boisterous dudes in farmer hats and overalls with big goofy grins? You bet! The ramen comes in three varieties. ワハハ (wahaha) - a niboshi tinged bowl of fat and fish. ガハハ (gahaha) - a chicken soup in the same manner. アハハ (ahaha) - the shop's tsukemen offering. A week or so after eating the wahaha, I was told that the gahaha is the one to try. Regardless of ordering the lesser recommended of the two, wahaha was as great as expected. Not as much back fat as Gamushara (when they serve their back fat covered shoyu), and not as much niboshi flavor as Nagi, but you can taste the master's training here. Finding out new ramen shops can take all shapes and forms. How I got to David's is as random as it gets. A yet-to-be-produced ramen TV show invited me to take a sample quiz. Soup trivia, shop origins . . . nerd stuff. I passed most questions, but one stumped me. "At what shop did TV personality David Ito do his training?" David who? David Ito (デビット伊東), nee Ito Tsutomu, has, like most minor celebs in Japan, acted in about a thousand dramas, starred in made-for-TV movies, and been on nightly variety shows by the boatload. Sorry, that's all I know. I watched some videos of his on Youtube, and was bored out of my skull within minutes. Using his notoriety, and a pitch to some TV show called とんねるずの生でダラダラいかせて, David decided to go into the ramen business. And the answer to the former question? He studied at famed Ippudo. Whether he studied making ramen (years to master) or just business practices (much less time) is something I am not sure of. His chain of shops, most in the west of Tokyo, now extends to Hong Kong and Macau; indicating the later. One of the shops is in the super-convenient Tachikawa NY Ramen Square. The style is a combination of Ippudo's Hakata style tonkotsu soup with some Tokyo flair. If you can call silky mounds of pork back fat flair. Which, of course, you can. It failed to impress, maybe the hype of eating something a famous person created was lost on me. A decent bowl, nothing special, and certainly nothing to go out of your way for. At last years Tokyo Ramen Show, the longest line was for the Toyama Black, an obsidian bowl from a few hundred kilometers away. Seriously, this place was hyped. It might have had something to do with the slew of awards that this creation had been given. The All Asia Gourmet Contest ABC Grandprix! I have no idea what that means! There was a B gourmet boom in recent years and awards are as common the often overrated shops that win them. But you gotta try it. Restaurant floors in expensive department buildings tend to fall on the expensive side, and ramen shops tend to be quite rare. They also tend to be of lower quality than their street-level equals. Yeah, ramen in department stores tends to be a losing endeavor. There are a few exceptions to the rule, would Toyama Black be among them? The "black" here is twofold. First, of course, is the shoyu used. A very high quality, very dark blend that turns the soup it's signature color. The second is the special pepper on top. Unfortunately, it isn't very good. Overly salty, and the pepper wasn't anything remarkable. I'm no expert on pepper, but it wasn't freshly cracked, the easiest way to level up your quality. They really should have done the "Would you like fresh ground pepper" routine, with staff doing the grinding at the table. "Say when!" If you, by some chance, have come to this site looking for information about Toyama, don't take this negative review to heart! Toyama is a wonderful part of Japan that I have been to numerous times. As for food, they have excellent seafood, drawing from the Japan Sea / East Sea / East Sea of Korea. The same international issues that plague the naming of international geography lead to Toyama being multicultural and thriving. Eat some fresh hotaruika (firefly squid) and masuzushi (pressed trout sushi), and maybe try Toyama ramen in it's natural habitat.